Q Acoustics 3050 review | What Hi-Fi? While Q Acoustics’ 2000i Series has been lapping up praise left, right and centre over the years – scooping up awards as it goes – its engineers have been hard at work trying somehow to reach new heights. Enter the 3000 Series, the company’s all-new budget speaker range. 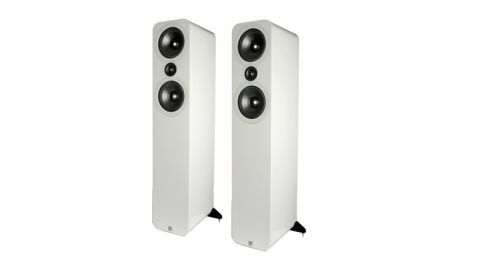 Here we have the range’s floorstanders, the 3050s. We had a gut feeling they’d be rather good even before laying eyes on them – aside from Q Acoustics’ irrefutably good track record with speakers, the standmounts from the range have already had us bandying words such as ‘sensational’ and ‘fabulous value’ about. As it turns out, we’re just as smitten with these. Far from minimal, the changes made over the 2000i Series (the firm’s existing budget speaker, on sale till the end of 2015) more than justify the new model number: the cone material of the twin 16.5cm mid/bass drivers has been changed from a paper/mica mix to a paper/aramid composition – aramid fibre (better known as ‘Kevlar’) strengthens the cone and makes its behaviour more predictable. According to Q Acoustics, that ensures more natural tonality. Interestingly, the 25mm tweeter now uses a diaphragm that combines the design elements of the ring radiator and dome to improve treble performance. The tweeter is decoupled from the main cabinet by butyl rubber, isolating it from the detrimental vibrations of the cabinet. The crossover uses higher-grade components, too, which supposedly limit distortion and reduce phase problems at the crossover point. Last but not least: the cabinet. Made from 15mm MDF panels with dual-layered 20mm top plate and an even thicker front baffle, it’s been further braced to control resonances and increase stiffness. Q Acoustics has also moved the bi-wire terminals from underneath the cabinet to the rear panel. You won’t hear us complaining: coincidentally, that makes them more accessible, too. As a result of the design revisions, the 3050s are super sturdy, epitomising the quality build we’ve come to expect from the company. True to their pedigree, they’re beautifully finished with familiar curvaceous corners and gorgeous colour finishes – matt graphic (black) or American walnut (brown) come as standard, while black or white gloss lacquers, or a more off-the-wall black-leather finish are available for a £150 premium. All in all, appearances aren’t too dissimilar from the 2050is (our current Award-winners): just slimmer (30cm) and shallower (20cm). The lean towers also borrow the plinth and easily adjustable spikes arrangement found on the higher-ranging Concept 40s, so that they can sit sturdily on any surface. While they’re smaller than the 2050is, they’ve gained in every aspect of performance. Despite Q Acoustics already leading in the sub-£500 floorstander market, it has somehow managed to significantly up the ante. The company has created a hugely likeable signature sound over the years: refined, subtle and suave yet full of punch and attack. The 3050s dutifully follow suit but prove more transparent, precise and authoritative than any of their predecessors. A full, agile and dulcet bass and crisp and controlled treble define their tonal balance, which in typical Q Acoustics fashion favours the rich side of neutral. That promises listeners a full-bodied presentation that’s solid and robust across the frequencies. Powerful and assertive, the 3050s deliver a huge sense of scale and are capable of enveloping our largest test room with ease. You can place them quite far apart without losing a tight stereo image, while they strike the best balance pulled at least 20cm away from the wall. Their musical, measured stance and crisp rhythmic drive lie at the heart of their sonic magic, and it’s this that causes us to consume an entire Dire Straits’ album before we know it. These speakers buckle down during Your Latest Trick; the chorus’s sweet-sounding saxophone soars though the wide-open soundstage with stunning clarity and texture, not to mention impressive scale. Dynamic shifts are apparent at any volume and there’s an unusually (at this price) high level of subtlety. By the time Brothers in Arms comes on, the 3050s have shown no sign of complacency. Electric guitar solos have plenty of elbow room, while the tender vocals are stacked with emotion and insight. The 3050s’ faithful reproduction would no doubt give decent speakers closer to the £1000 mark a run for their money – and that’s some feat. Hats off to Q Acoustics: these speakers are yet another staggering achievement. For the money, they’re sublime.